We do not accept Scottish currency. We do not accept any foreign currency. Optical Drive: DVD-RW. Collection in person Collection in person is usually permitted. Card Reader: Yes. Bluetooth: No. Ethernet Port: Yes. Webcam :YES. Keyboard Layout :UK (QWERTY) Version. 12 MONTHS WARRANTY. Warranty : 12 Month. USB Ports : 3. Hard Drive : 250GB HDD. BullGuard Internet Security Antivirus 1 Year 3 Device Protection Easy To Use. BullGuard Internet Security. 3 Device Protections. TROB: 4051528010176 REF-GR-C TOSHIBA BUNDLE. 16: 9 height / width ratio. From the date which you received it. Hard Drive: 750Gb SATA. RAM: 6Gb (4Gb 2Gb) DDR3-10600 1333MHz. Read about it here: Google 'Toshiba C850-13C CPU'. Toshiba Power Adaptor included. A refurbished laptop in good used condition, little visible wear except for moderate marks on lid where I removed a large sticky label. Toshiba Satellite Pro C850-1HE Used, in good working conditions Battery is holding charge Comes WITHOUT CHARGER! HDD/RAM size are in pictures. Any concerns, please ASK BEFORE PURCHASING THIS ITEM! Postage to U.K. Mainland only! For postage outside U.K. Mainland, please contact me BEFORE bidding/buying! Type : Toshiba HD non-reflective High Brightness. Hard disk capacity : 500 GB. display with 16 : 9 aspect ratio and LED backlighting. Windows 10. Max Refresh Rate : 100 Hz. Battery technology : lithium-ion. BullGuard Internet Security 1 Year Protection up to 3 Devices. This is ideal for applications such as spreadsheets, and will ensure that typing on the C850 is always a comfortable experience, wherever you are. Hard disk capacity : 128GB SSD. Graphics adaptor type : AMD Dual-Core Processor E1-1200 APU with AMD Radeon™ HD 7310 Graphics. Processor type : AMD Dual-Core E1-1200 APU. type : Toshiba TruBrite® HD TFT High Brightness display with 16 : 9 aspect ratio and LED backlighting. BullGuard Internet Security Antivirus 1 Year 3 Device Protection Easy To Use. This is ideal for applications such as spreadsheets, and will ensure that typing on the C850 is always a comfortable experience, wherever you are. 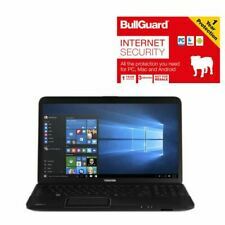 BullGuard Internet Security Antivirus 1 Year 3 Device Protection Easy To Use. BullGuard Internet Security. 3 Device Protections. TROB: 4051528042887 REF-GR-A TOSHIBA BUNDLE. 39.6cm (15.6”), Toshiba TruBrite® HD TFT High Brightness display with 16 : 9 aspect ratio and LED backlighting. Toshiba C850 15.6". 1x Toshiba C850 15.6". As part of the sale you"ll receive. Installing a laptop screen. Installing a laptop motherboard. Installing CD player to an amplifier. COLLECT IN PERSON Yes sure collections are preferred. When can I expect my order to arrive?. Do you have more detailed information on this item?. 8GB DDR3 RAM. This laptop has been upgraded from its original spec and is in good working order. 15.6" LCD Widescreen. Good Working Battery. VGA & HDMI ports. Multi Card Reader. LAN (ethernet port). Wifi (built in). Brand: ToshibaProcessor: Intel Core i7 1st Gen.
Toshiba C850 15.6". 1x Toshiba C850. As part of the sale you"ll receive. Type: Notebook/LaptopBrand: ToshibaProcessor: Intel Core i3 2nd Gen.
CPU/Processor AMD E1. Hard Drive 320 GB HDD. Laptop Condition. DVD Drive Yes. Software issues such as virus attacks are not covered under the warranty. Why Buy From Us?. Screen Size 15.6. Hard Drive 320GB. Processor AMD - E1 - @ 1.40ghz. (Hardware only, excluding consumables i.e. battery). If the warranty seals have been removed or tampered with then this does void any warranties. Optical Drive DVD-RW. Hard Drive 750GB. (Hardware only, excluding consumables i.e. battery). If the warranty seals have been removed or tampered with then this does void any warranties. Optical Drive Yes. Audio/Microphone Port. T on the keyboard does not work. Toshiba Satellite C850-1G5 (500GB, Intel Celeron, 1.8GHz, 6GB) Laptop - Matte.... Condition is Seller refurbished. Built for outstanding value, you get your perfect performance mix with the latest processors, latest graphics and hard disks with up to 750 GB. The C850 features two USB 2.0 ports and one USB 3.0 port for fast data transfer. Windows 10Pro 1803 64bit. · 39.6cm(15.6”), Toshiba TruBrite® HD TFT High Brightness display with 16 : 9 aspectratio and LED backlighting. · MattBlack Finish with textured pattern, black keyboard. · Harddisk 320 GB. Windows 10 Pro 1809 64bit. · 39.6cm(15.6”), Toshiba TruBrite® HD TFT High Brightness display with 16 : 9 aspectratio and LED backlighting. · MattBlack Finish with textured pattern, black keyboard. · Harddisk 320 GB. Windows 10 Pro 1809 64bit. Toshiba HD Webcam. VLC Player 3 or Later. Aiseesoft DVD Converter suite. Aiseesoft mp4 Converter suite. Audio Converter suite. Microsoft Security. Software Installed. Windows 10 Pro 64bit 1809 Edition. Toshiba HD Webcam. Audio Converter suite. Aiseesoft mp4 Converter suite. Aiseesoft DVD Converter suite. Microsoft Security. Excellent Condition. Hard Drive: 500GB HDD (SATA). Make: Toshiba. 3rd Generation Processor. OS: WIN 8.1 Pro. Signs of use, marks and / or scratches - See photos. Optical: VGA, HDMI, USB2, USB3, Bluetooth, Web-Cam. This warranty only covers hardware. If the PC is faulty, you MUST report the fault as soon as possible. 500 GB DARD DRIVE. window 10' 64 bit upgrated from window 8. Wow, what a deal! MANUFACTURER Toshiba. OS Windows 10, 64-bit, Professional. You won't find cheaper prices anywhere! Rapid IT's highly trained staff each have their designated area of expertise, so should you need advice or assistance you know you'll be getting the best possible help. Type: Notebook/LaptopBrand: ToshibaProcessor: Intel Core i3 3rd Gen.
750GB HDD storage. Entertain the family by connecting your laptop to a HDTV or monitor using the HDMI connection. Everyone can then enjoy your photos or videos on a big screen in great HD quality. It features a 15.6” display and textured matt black finish. 250Gb Samsung SpinPoint M5S. It has a 250Gb Samsung SpinPoint M5S Model No: HM250JI SATA HDD but it takes SSDs without any problems. Adobe Acrobat Reader. 4Gb DDR3L 1600MHz SDRAM. Toshiba Service Station. Toshiba C850. 1x Toshiba C850. As part of the sale you"ll receive. Windows 7 Professional 64 Bit Installed (Factory Partition). ComputeUK - Suppliers of new and used Computer and IT related products. Yes (Supplied With Power Adapter & Power Cable). Power Adapter. 3: 2 x USB 2.0, 1 x UDB 3.0: HDMI x1. BUY FROM A TRUSTED PROFESSIONAL. Product Images Gallery. Storage 1TB HDD. Toshiba C850-1LQ. Make Toshiba. We will only use your data to provide the requested service. We will only share your data with 3rd parties to ensure the execution of this service. We will never use your data for targeted advertising. Good condition fairly few marks for second hand. Brand: ToshibaProcessor: Intel Core i3 3rd Gen.
320Gb Toshiba SATA HDD. It has a 320Gb Toshiba SATA HDD Model No: MQ01ABD032 but it takes SSDs without any problems. Adobe Acrobat Reader. 4Gb DDR3L 1600MHz SDRAM. Toshiba Service Station. Microsoft Office 2007 .